If you walk away from the main stage and listen to sideline interviews, you might get occasional hints of disarray among the delegates. With the US pressuring its allies to approve new "initiatives" — be it Venezuela regime change, or Trump's idea to abandon the INF Treaty, with the latter putting European allies under the threat of potential Russian countermeasures — it seems that these ideas have brought forth subtle, yet noticeable discontent on the part of the "Old World". Washington's demands to increase military spending by those NATO members who don't pay as much as the US does, which have often been voiced by Donald Trump and members of his administration at meetings such as the MSC, don't sit well with many European voters, and German ones in particular. A few blocks away from the MSC venue, hundreds of protesters have gathered to rally against NATO's wars, and to criticise what they see as "outlandish military spending". "The figure, which is communicated in the press, which is 2% of GDP sounds so small", says Franz Haslbeck, a Bavarian peace activist and one of the organisers of the annual #AntiSiKo rally in Munich. "Actually it's 20% of the whole budget in the Federal government. So, every 5th Euro goes into the military. In the future, this would mean that within quite a few years Germany would spend for the military even more than Russia. This is not only unnecessary, this is counterproductive for all the budgets we have — for the social budgets, for ecology, for education et cetera". Many slogans at the Munich peace rally reflect the messages that Russia has been trying to convey to its western partners: the calls to stop NATO's eastward expansion, the dangers of Poroshenko's warmongering in Ukraine and the need to stop the global arms race. — Denis Bolotsky (@BolotskySputnik) 16 февраля 2019 г. Despite Washington's call to put more pressure on Moscow in Munich, German Chancellor Angela Merkel refused to exclude Russia from the dialogue. — Dan Popescu (@PopescuCo) 16 февраля 2019 г.
Russian Foreign Minister Sergei Lavrov had a very busy schedule at the event. He met with his counterparts from Belgium, the Netherlands, China, Germany, and many other nations. On 15 January he also held talks with the head of EU diplomacy Federica Mogherini and with NATO Secretary General Jens Stoltenberg. — Denis Bolotsky (@BolotskySputnik) 17 февраля 2019 г. After the meeting with Taro Kono, Lavrov talked to journalists about his views on this year's MSC. He pointed at the general sense of disarray among the participants, and shared some impressions from his talks behind closed doors. According to Russia's top diplomat, the overall tone of discussions was constructive, even during his meetings with politicians who are known for their harsh criticism of Moscow's policies in other institutions, such as the European Parliament. The Munich Security Conference is an annual international forum dedicated to diplomatic, security and military issues. 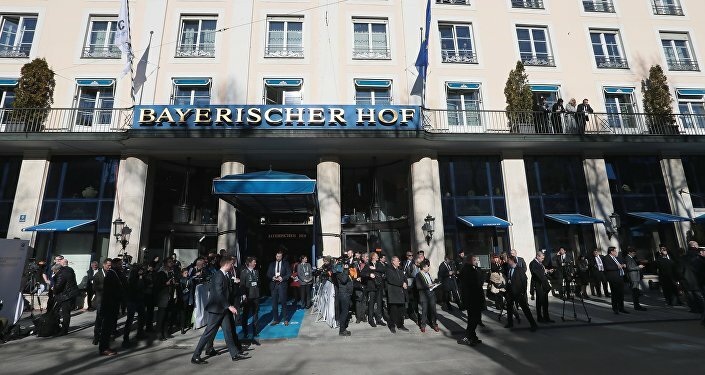 MSC 2019, which is being held in the Bavarian Capital from 15 to 17 February is being attended by 450 delegates.